Found this little ‘thing’ last time I was out thrifting. Have NO IDEA what it is. It was in with the kitchen stuff. It’s tiny. 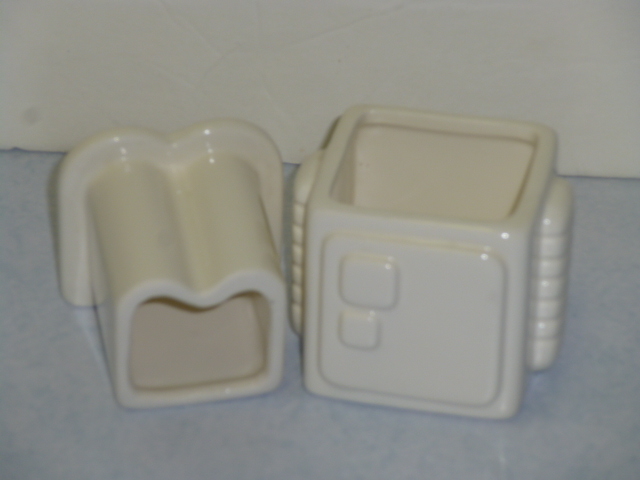 Just 2-1/2″ tall x 2″ wide. It’s 2 pieces. The top lifts off, and is shown on the left in the above picture. It ‘somewhat’ reminds me of the general principle of a butter bell. But I would be awfully hard to get butter out of that small, oddly shaped top part. Anyone know what this thing is???? First correct answer, and the internet link to validate the answer (otherwise how would I know!?!) will win any one of my e-books of their choosing. Post your answers and link via a comment. WE HAVE A WINNER!! Beth C. provided the correct answer AND the link to prove it. Gotta say that I never would have guessed that!!! I think what had me SO fooled was that the pieces were staccked inside each other when I bought them. But they are not intended to fit together like that! Good job Beth! Let me knwo which of my e-books you’d like. 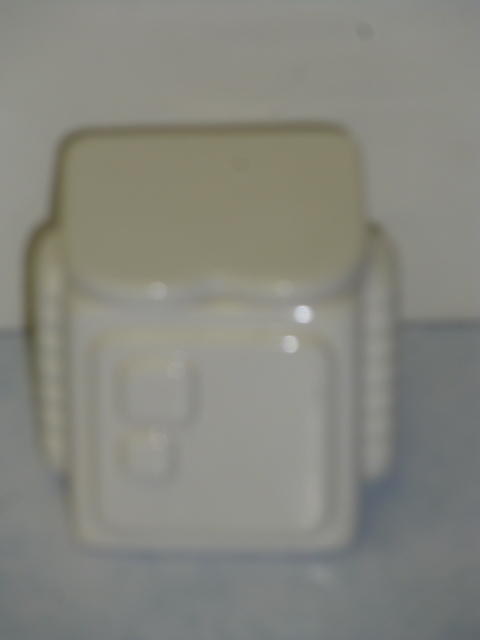 I think it is for butter…have you seen the pottery ones at craft fairs ? You fill one side, the smallest side then the other side encloses it. Not positive, but that’s my guess ! It is a robot shaped planter.